Built in 1727, Raj Palace was once the city’s first palace. Featuring a charming interior with crystal chandeliers and double-height ceilings, the luxurious hotel offers a spa and free parking. Rooms at The Raj Palace are spacious and decorated with traditional Indian décor and antique furnishings. Modern amenities include cable TV and air conditioning. Many rooms have pieces from the Royal Family’s museum collection. Guests can relax in Raj Palace’s swimming pool or schedule a massage treatment at the spa. On site entertainment includes a theatre and marionette show. Swapna Mahal serves a variety of international cuisine. The Kebab Shop offers Mughlai cuisine, including barbecue dishes. Drinks and fresh pastries can be found at The Royal Lounge. 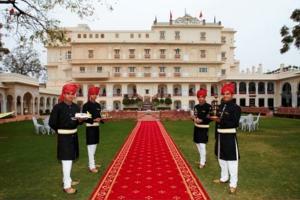 The Raj Palace is a 20-minute drive from Jaipur International Airport. It is a 10-minute drive from the Amber Palace Fort and a 5-minute drive from the Lal Mahal Lake. Rooms: Hotel Rooms: 38, Hotel Chain: Small Luxury Hotels of the World. Wi-fi is available in the entire hotel and costs INR 227 per hour. Free! All children under 3 years stay free of charge when using existing beds. There is no capacity for extra beds/cots in the room.